The job role of a Boiler Technician involves representing energy providers and visiting customers at their homes in order to carry out repair or maintenance work to their boiler. You will need to undergo security checks, and possess a drivers licence and be polite and professional at all times. The role can also be carried out at major works plants, working on pressure boilers. 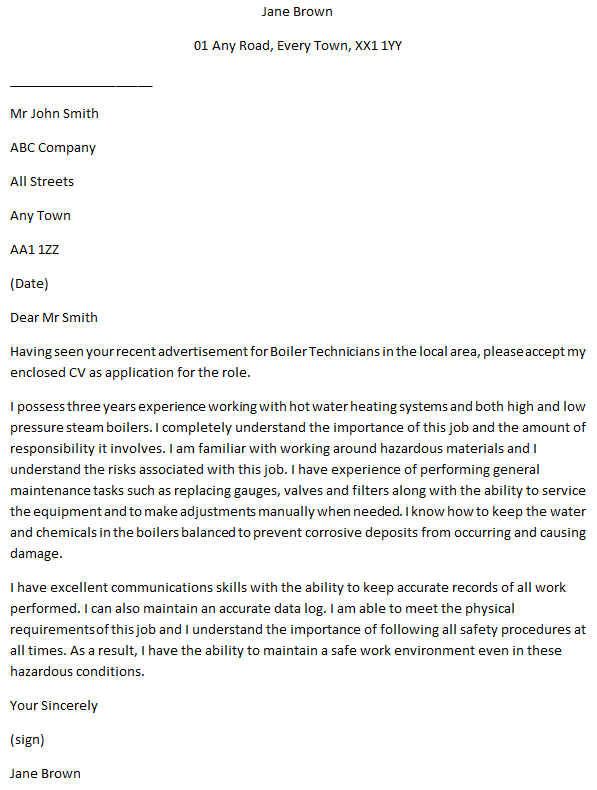 Having seen your recent advertisement for Boiler Technicians in the local area, please accept my enclosed CV as application for the role. I possess three years experience working with hot water heating systems and both high and low pressure steam boilers. I completely understand the importance of this job and the amount of responsibility it involves. I am familiar with working around hazardous materials and I understand the risks associated with this job. I have experience of performing general maintenance tasks such as replacing gauges, valves and filters along with the ability to service the equipment and to make adjustments manually when needed. I know how to keep the water and chemicals in the boilers balanced to prevent corrosive deposits from occurring and causing damage. I have excellent communications skills with the ability to keep accurate records of all work performed. I can also maintain an accurate data log. I am able to meet the physical requirements of this job and I understand the importance of following all safety procedures at all times. As a result, I have the ability to maintain a safe work environment even in these hazardous conditions. Thank you for your time and considering my job application.